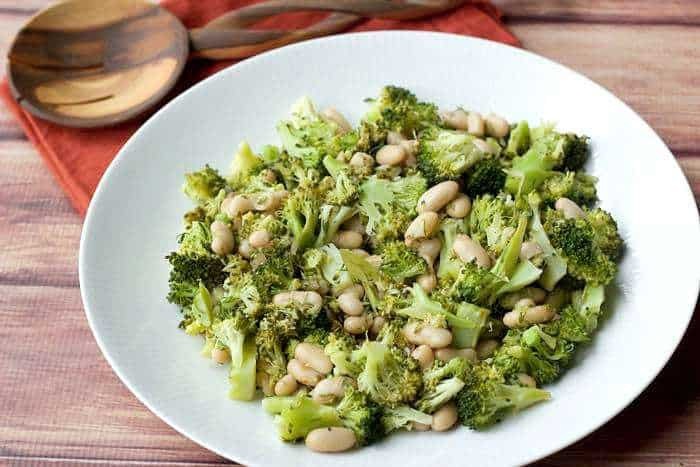 Broccoli white bean salad is a quick and satisfying lunch. Happy 2015! Even though the turning of the year always ends up being less-than-important to celebrate (Y2k anyone?) I like to embrace it. We’ve spent some of our holiday break decluttering, getting rid of old papers, and sorting out our files. I’ve been re-organizing my desk for ultimate productivity, and I’m determined to keep to a more focused work schedule. No more staring at Facebook for an hour. Oddly, that sort of work schedule also means that I’ll finally remember to eat lunch at a normal time. Even though I develop recipes all the time, I still manage to either completely miss lunch or eat it right before I have elementary school pickup. That doesn’t quite work out well in terms of keeping my body and my brain from going insane. To combat that I’ve been making things that are put together quickly and in advance. That way I can just run to the fridge and dish out what I need without any prep whatsoever — the multitasker’s savior. Lately I’ve been really into broccoli. Blame my kids — no, really. You see, broccoli is possibly the only vegetable that both of them will eat happily. The toddler won’t eat peas, and the older kid won’t eat potatoes except mashed (I know), so broccoli is always in the house. This time of year, the broccoli is pretty great. It’s a cold-weather veggie and my completely nonscientific theory is that our cold snap in November helped produce a great crop. Broccoli and white beans isn’t a new combination, though it’s quite often a summertime salad. Instead of a creamy dressing I keep things simple and bright with lots of fresh chopped dill and lemon juice. There’s some onion in there too because duh, onions, the building block of cooking, but it’s not overpowering to the final dish. Note that I have listed salt and pepper “to taste” in this recipe. I know some don’t like this instruction, but there are a few variables at play here: whether you bought regular or low-salt beans, and just how salty you like your food. I’m on the low-salt spectrum for many dishes, so season to your own liking. And as for this recipe being a winner? Well, my husband stole the rest of this salad for his lunch, so I’ll chalk that up as a success. Steam broccoli over a pot of boiling water until bright green and tender, about 3-5 minutes. Set aside. In a large skillet, heat olive oil over medium. Add onions and saute 2 minutes. Add beans and cook about 2 minutes, then add broccoli and dill and stir to combine. Stir in lemon juice, salt, and pepper. Taste and adjust seasoning, and serve. Serve warm, room temperature, or store in the fridge and enjoy cold. Nutrition calculated through My Fitness Pal. This sounds good and simple. I’ll put it in my list to try out.